TOP > Professional 4K Camcorder > AG-CX350 > Supports multi-codec recording of high-quality 10-bit images without cropping in all modes. without cropping in all modes. * Playback may lack smoothness depending on the PC environment, such as storage and memory devices. In UHD, variable frame rate (VFR) recording at 1 fps to 60 fps is possible. In FHD, super-slow can be realized at a maximum of 120 fps. Both provide high-quality 10-bit, full-frame pictures with no image area cropping even at high frame rates. The AG-CX350 records MOV files that are highly compatible and easy to use. 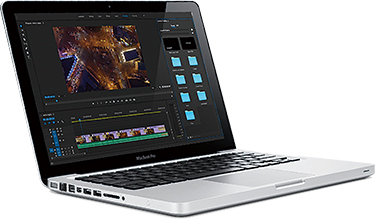 This file format is the same as that used on Panasonic’s compact cinema camera, the AU-EVA1, and supports file names with up to 20 characters, allowing recorded video clips to be easily managed. The AG-CX350 also supports conventional AVCHD recording, including the AVCHD 8 Mb/s mode, used widely as the format in college and professional football coaching analysis. And it will support the MXF P2 file format for broadcasting in the future,* enabling AVC-Intra or AVC-LongG recording. * Future support by a firmware version upgrade for recording onto microP2 cards. When playing back video clips on the AG-CX350, any desired frame can be captured as a still image (JPEG) and recorded onto an SD memory card. Video playback, frame advance (+/-), and still-image captures can all be done intuitively by touch panel operation. Two SD memory card slots capable of using SDXC/SDHC/microP2 cards*1 enable unlimited*2 relay recording by simply changing SD memory cards. Recording reliability is further improved with simultaneous recording and background recording. And the AG-CX350 is equipped with Pre Rec, Interval Rec and Time Stamp recording functions. *1 For memory card usage conditions, see the “Recording Media”. *2 If the Relay recording time reaches 10 hours, shooting will temporarily stop, and then automatically restart a few seconds later. If it is recorded in MOV format, the file will be split every 3 hours and recorded. 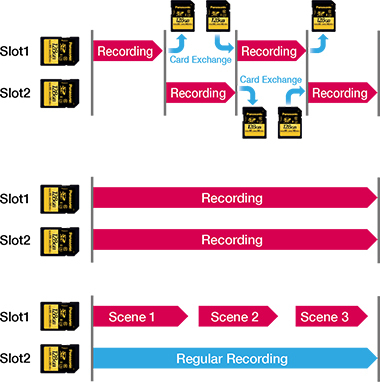 Automatically records continuously from Slot 1 to Slot 2. By changing a full card with a new card, images can be recorded continuously for many hours. Identical data is recorded onto cards in both slots in this dual recording mode. Records ordinary Rec Start/Stop-controlled data in Slot 1, and records all data, even when Slot 1 is stopped, in Slot 2. * VFR is supported only in Progressive mode. Square brackets [ ] indicate a system frequency of 50.00 Hz.